The Mayfair is one of our range of classic men's pyjamas, and is the kind of pyjama on which the Derek Rose reputation is based. Made from a cotton with a luxury twofold yarn in the satin, this fabric lasts a long time and retains its colour and shape excellently. Styled for comfort and relaxation these pyjamas feature a three pocket jacket, classic collar and adjustable two-button waistband. Elasticated sides on the trousers mean the front and back are flat for your comfort. 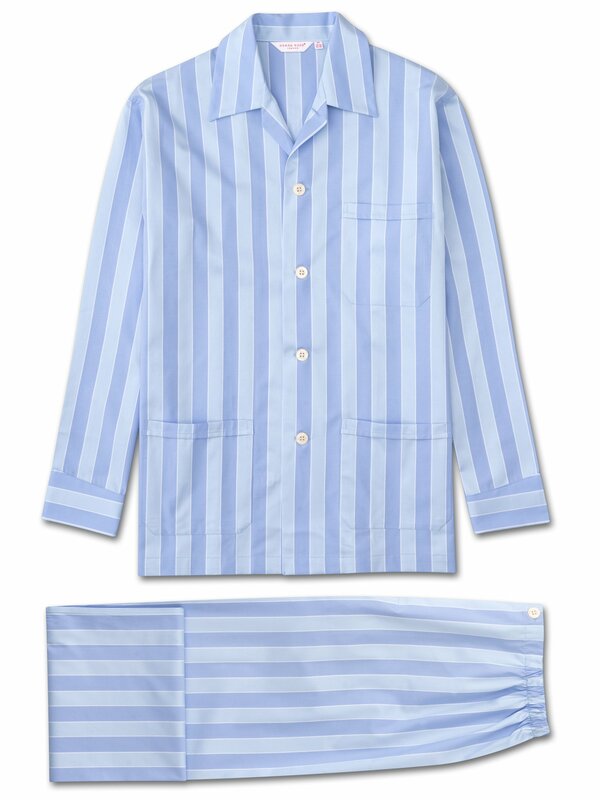 Wear the Mayfair pyjama for a classically elegant look — especially when combined with one of our navy dressing gowns. Model is 6'2" with 40 inch chest and wears size medium.